Catch a crossfading sample of Shoujobyou’s C69 release-scheduled Real Clannad image album (or CLANN soundtrack, whatever you want to call it) at the circle’s official site. Toranoana is now hosting all four commercials for the Moetan Listening CD if you can’t be bothered to click between the two sites. The first episode of web radio for the upcoming Dai Mahou Touge OVA is online today. Also, another episode of Mahou Sensei Negima radio and My Otome radio / TV. When Media Works represents at Comiket, they do it with style. Sign me up for the B2-size Fuuka poster and the Otona no Moeoh, and maybe the Tony calendar as well. In other Media Works news, a list of Dengeki December release manga is online along with details on the December 27th edition of Dengeki GAO, complete with a Ren mini-figure from DearS. The captives on the Satellite of Love penned a song called “Creepy Girl” for one of the characters in Catalina Caper, but Candy Girl may have been a more appropriate title. WHF Ariake 13 was yesterday, and the spoils have already begun showing up at usual suspects such as Akibajin and Earl Box. 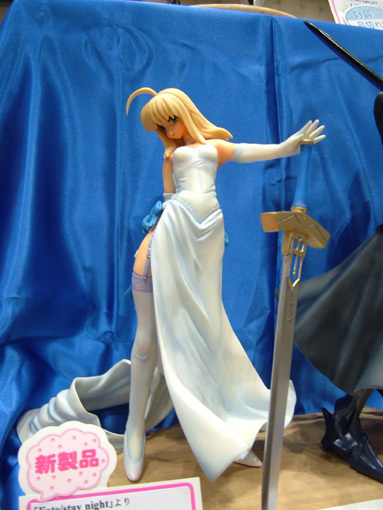 Some very nice figures this time around; I can only hope they’ll be available at the 2006 winter Wonder Festival in February as well. I expect further, more substantial WHF updates to appear over the next few days, which will be scooped when able. Stay tuned! For those keeping track, Figure Alternative has updated its various release schedules through next April. Atelier-Sai’s Chidori Kaname clothes-changing version PVC from Full Metal Panic!